Lincolnshire's rail passengers are now benefiting from faster, more frequent and safer journeys following the completion by Network Rail of the final phase of the �£55m project to renew 6,500m of track, the signalling system and install two Polysafe level crossings in the centre of Lincoln. Lincoln's High Street level crossing situated right in the heart of this historic city is perhaps one of the busiest level crossings in the country, being used continuously by both pedestrians and traffic all day, every day. Whilst still performing well and meeting safety standards, the millions of tons of road and rail traffic that have used it have, over time taken its toll. 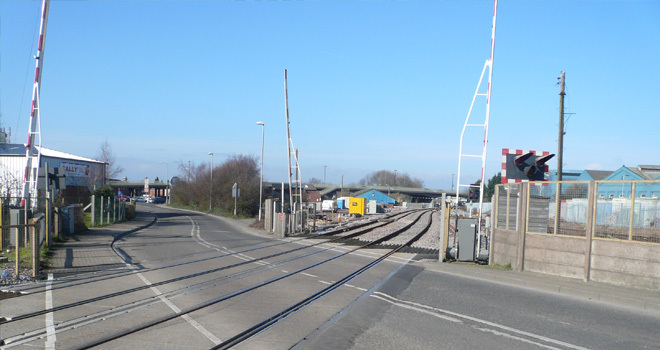 The decision was taken by Network Rail to renew it, and after due consideration it was decided that the best option was a Polysafe steel framed polymer level crossing. Several advantages of the Polysafe system were considered key in its selection. On such a high-traffic crossing, low maintenance and a long life span are vital. Polysafe polymer panels are capable of consistently taking heavy loads and are expected to last 15 years. Many examples exist where such panels have been in place for over 20 years and are still performing safely. Other systems do not offer this same long term life span and resistance to loads. Although not generally taken at speed, the sheer volume of road and passenger traffic inevitably means that cars and lorries often need to brake heavily on the crossing. A high grip surface, especially in the wet, was required. With their high grip topping Polysafe panels offer much more grip than other level crossing decks. White lines and yellow hatching are applied to increase safety. As Polysafe decks have a similar surface to that of a road, these can be applied easily and in the knowledge that they will not wear away readily and will therefore last many years. This is a key safety and maintenance advantage over other level crossing types. In this case, the fact that the surface of the crossing matches the roads that lead up to it means it blends in with its historic setting. At the Sincil Bank crossing, the last 20 years have seen a significant increase in industrial traffic volume and weight in the area and level crossing usage has increased dramatically. 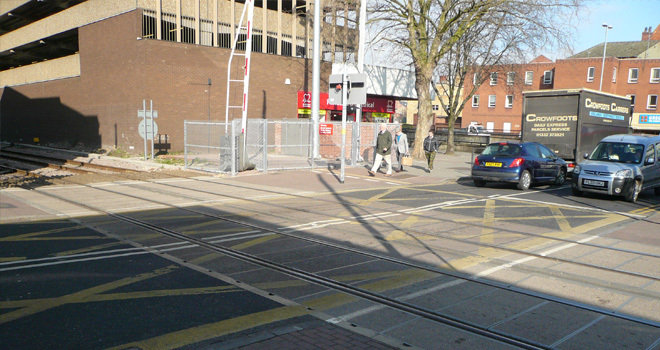 The same durability against day-to-day punishment, high load bearing, low maintenance and safety benefits that applied at High Street meant that Polysafe were also awarded the contract for this crossing. The installation of both crossings was completed well within the time frame allowed, minimising the impact on road and rail traffic.